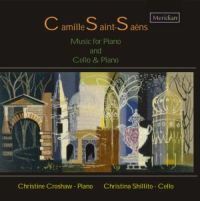 The Saint-Saëns CD is a new release showcasing not just the composer's underrated chamber music, but also the multiplex talent of two stalwarts of the Meridian label, cellist Christina Shillito and pianist Christine Croshaw. This disc and the Hummel are, respectively, the latest and earliest of several Croshaw/Shillito collaborations for Meridian, with or without other soloists, in a rewarding association spanning two decades. 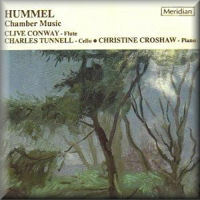 A second volume of Hummel (CDE 84236) appeared shortly after the first, Croshaw this time performing with dependable flautist Clive Conway and violist Norbert Blume. This was followed by the Weber disc, and then a CD of Carl Czerny's chamber music (CDE 84310), with Croshaw, Shillito, Conway and Nicholas Bucknall on clarinet and Stephen Stirling on horn. Then came another Croshaw/Shillito/Conway CD of chamber music by Jan Ladislav Dussek (CDE 84383), again with Blume and Susan Lynn on violin. Before the present Saint-Saëns disc came another Croshaw/Shillito/Conway collaboration for chamber works of Ignaz Moscheles (review). Besides the performance crew, there are other parallels and similarities to be found among the three discs under review. For one thing, the sound quality is uniformly good. Meridian's "Natural Sound Recording", however they accomplish it, does not disappoint - though it has to be said that 2011 sound technology is still an improvement on that from the 1990s, even if Shillito and Croshaw are set further back from the microphones than can be considered ideal. There are also resemblances, presumably coincidental, between the Hummel and Weber recitals. 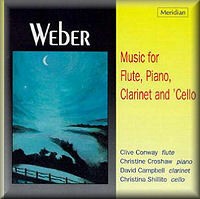 There is a Flute Trio apiece, both dating from the same year, a virtuosic work for solo piano that allows the listener space to marvel at Croshaw's musicianship, and a Sonata in each programme, Hummel's for cello and Weber's for piano, as re-scored by the composer August Müller for flute and piano; and Hummel too has a work for this last combination, the eminently hummable Grand Rondeau Brillant. Fifteen years later, the Saint-Saëns disc is a little bit different in emphasis, but the Cello Sonata is a direct descendant of Hummel's, and there are further solo piano works permitting an appraisal and appreciation of Croshaw's pianistic development. Saint-Saëns' chamber music is still woefully under-appreciated, and the Cello Sonata is a case in point, arguably the finest work on offer here. Its sometimes dark, always atmospheric, restless character gives the lie to the popular notion that he was all tunes and no substance. His jaunty, straightforward Allegro Appassionato in B minor op.43 is more frequently encountered, both on disc and on stage, yet is less than typical of his output. Rewind fifty years and Saint-Saëns could almost have written Hummel's own Cello Sonata op.104, a supremely lyrical work of classical elegance and warmth, whose tailor-made cello phrasing Christina Shillito unfolds with memorable refinement. This performance sparked a handful of further recordings for the next few years, but the work appears to be going out of fashion again, an ironic state of affairs in view of its massive audience-friendliness. Weber's Piano Sonata op.39 is similarly conspicuous by its absence from the repertories of pianists today. Virtuosic, dramatic, witty and elegant, it has much to recommend it, and August Müller's skilful conversion of it into a Flute Sonata adds extra spice, especially in Clive Conway's hands and lips. In her booklet notes, Croshaw describes Weber's Trio as a "pastoral drama" permeated by "a note of melancholy", reflecting an unhappy time in the composer's personal life. Such an assessment does not account for the sprightly scherzo, but the work, though less profound than Hummel's, is certainly tinged with nostalgia and full of poignant lyricism, enhanced by some beautiful part-writing. On the subject of programme notes, they are in all three cases written by Croshaw, and are good as far as they go, communicating her obvious and justified enthusiasm for these relatively neglected works. However, the notes often go beyond pithiness - these are the two lines, for example, for one of Hummel's works: "The Trio, op.78, was composed in 1819. Its original title was as follows: 'Adagio, Variazionen and [sic] Rondo über ein Russisches Thema für Pianoforte, Flöte und Violonzell von Johann Nepomuk Hummel.'" Hardly enlightening, yet twenty years later there has been no evolution: Saint-Saëns' Allegro Appassionato op.70 "is a brilliant bravura work, written in the style of a toccata." Similarly, biographies of composers and performers alike leave the reader feeling under-nourished - Shillito's is rather brazenly reproduced verbatim from the Weber for the Saint-Saëns, leaving the last 15 years unaccounted for. A little photo or engraving here or there would have brightened the texts up a bit. Quite unnecessarily, by the way - not to mention entirely without relevance - Croshaw notes that "it is believed that Saint-Saëns was homosexual, a fact that, if true, was greatly at odds with his public image". Fortunately for music-lovers, however, Croshaw took up piano playing as a career, not note-writing. Her nuanced, revelatory pianism seems almost outside of time in its understated eloquence, and in a way the chosen repertoire is perfectly suited. Her artless poetry at the keyboard is evident in Saint-Saëns' retro, and magical, Piano Suite, for example. Her athletic legerdemain in Hummel's Rondo Brillant in B minor seems undiminished in the hugely strenuous En forme de Valse in D flat or the Allegro Appassionato op.70 of her Saint-Saëns recital, even though Croshaw is by now well into her sixties and only partially sighted. On a wider level, these are all performances not of bright young things anxious to be different or show off their virtuosity at every phrase, but of musicians. This is music-making that comes from experience, from looking deeper into the score - especially in the case of Hummel and Saint-Saëns, who had left behind the emotional melodrama that can occupy a young man's mind. They were writing music that betokened a deeper kind of intellectual insight and expressive intensity. For minutes to the pound and instrumental variety, the Weber CD is a winner, whilst for sheer classical beauty Hummel's music is hard to beat. The Saint-Saëns disc is rather short and the recording slightly recessed, but as an opportunity to hear Shillito, Croshaw in the autumn glow of her career, and the fruits of Saint-Saëns' great imagination all in the same place, it is easily worth the asking price.